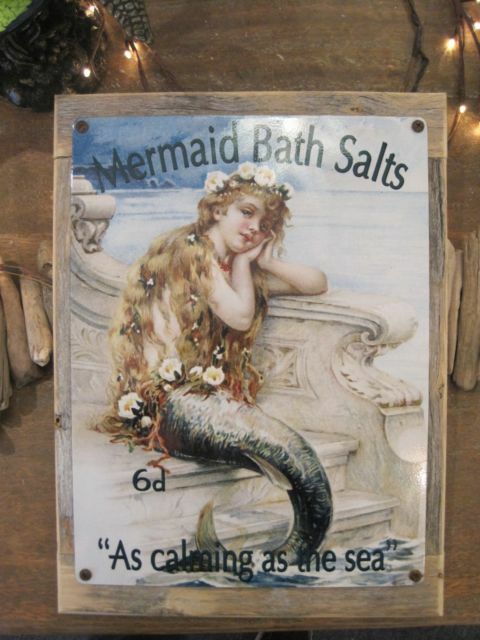 17" x 13 1/2 "
This super cool “Mermaid Bath Salts as Calming as the Sea” sign is perfect for anyone who loves mermaids! It is perfect to hang in an entryway or any room in your coastal home! The very shabby chic combo of a metal sign mounted on heavy, distressed and weathered wood makes this awesome sign especially appealing. 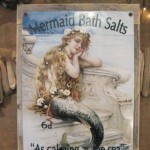 It blue lettering and a portrait of a gorgeous mermaid sitting on a white bench. The sign is both sturdy and durable. It has a sawtooth hanger on the back for easy hanging. The sign measures 17 inches tall by 13 1/2 inches wide. It’s very striking and so beachy! Perfect for a beach house or any place you want to tell everyone just what you love about the wonderful beach! It’s a great high quality piece to add to your coastal decor! Makes a great gift for anyone who loves the beach!